There was a time when children's television programming was safe. By that I mean that it didn't throw too many radical ideas at the viewer. Sure, there were unusual things like talking dogs, flying dune buggies, and sports competitions featuring a roster of animated characters, but all of these things stayed within the boundaries of creative imagination. Then, in the 1990s, things started to get weird. Show ostensibly aimed at kids began to introduce bizarre storylines that often made little narrative sense and the raison d'etre seemed to be placing the characters in odd situations. Apparently, this type of storytelling proved to be popular, as it's continued to this day. And this is what has lead to projects like Teen Titans Go! To The Movies. Teen Titans Go! 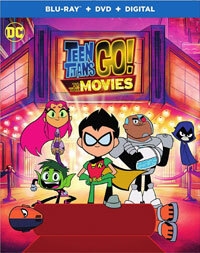 To The Movies rolls out the familiar members of this super-hero group -- Robin (voiced by Scott Menville), Starfire (voiced by Hayden Welch), Raven (voiced by Tara Strong), Cyborg (voiced by Khary Payton), and Beast Boy (voiced by Greg Cipes). We first see them attempting to fight a bubble-monster...and failing. This leads to yet another situation where the realize that they aren't respected by other super heroes. While crashing the premiere of the latest Batman movie, Robin realizes that the Teen Titans needs a movie in order to get respect, and, in order to get that movie, they must have an arch-villain, such as Slade (voiced by Will Arnett). So, the team's usual pursuit of fighting crime begins to morph into a pursuit of fame. Over the years, my exposure to Teen Titans has been somewhat limited. I, of course, got the epic X-Men Vs. Teen Titans crossover comic in the early 80s and I reviewed Justice League Vs. Teen Titans and Teen Titans: The Judas Contract, both of which featured a Teen Titans group which was more akin to the Cartoon Network series which ran from 2003-2006. My daughters were big fans of that show, but they had provided negative reports on the recent reboot Teen Titans Go!, citing that they liked the original show much more. Well, I hate to break this to them, but if the feature-film Teen Titans Go! To The Movies is anything like the show, then they are missing out. First and foremost, it should be said that if you are looking for gritty, hard-hitting action, then you are looking in the wrong place. I know that some like their Teen Titans to have a dark edge, but Teen Titans Go! To The Movies takes things in the opposite direction. For lack of a better term, this movie is silly, and I mean that in the kindest way possible. From the outset, it's clear that this is a comedy and that the intent is to have a good time. Yes, there are some action sequences, but the emphasis is on the characters and the laughs. The comedy comes from two places. First of all, Teen Titans Go! To The Movies is so meta that it almost wraps back around itself. The driving principle of the story is that even the most obscure comic book characters are getting feature films these days, so why not Teen Titans? The movie pokes fun at comic book, super hero movies, Hollywood, and entertainment in general. It takes shots are hallowed comic book icons with abandon. (There is even a very surprising cameo from a real-life comic book legend.) The jokes are very relevant, so much so that parts of the movie may be dated in a short time. The other element of the humor comes from sheer weirdness. Surprisingly, Teen Titans Go! To The Movies is a musical and the songs come out of left field. The high-point of absurdity arrives in the form a Tiger who sings a song. Did I mention that the tiger is voiced by Michael Bolton? This rainbow-filled musical number ends with the funniest joke in the film, and it's one which will most likely sail over the heads of younger viewers. Teen Titans Go! To The Movies may lead to some "Who's Deadpool?" questions on Blu-ray Disc courtesy of Warner Bros. Home Entertainment. The film has been letterboxed at 1.78:1 and the Disc contains an AVC 1080p HD transfer which runs at an average of 33 Mbps. The image is very sharp and clear, showing no overt grain and no defects from the source materials. The colors look fantastic, and the bold tones really stand out here. The image is never overly dark or bright. The level of detail is very good and the animation shows off a quasi-3D effect. The Disc carries a DTS-HD Master Audio 5.1 track which runs at 48 kHz and an average of 4.0 Mbps. The track provides clear dialogue and sound effects. The action sequences deliver strong subwoofer effects which emphasize each explosion or punch. These same scenes offer nicely detailed surround sound which often highlight individual sounds. The stereo effects show good separation and nicely highlight sounds coming from off-screen. The Teen Titans Go! To The Movies Blu-ray Disc contains a few extra features. "Teen Titans Go! : WB Lot Shenanigans" (4 minutes) is an odd live-action interstitial in which five people dressed in exaggerated Teen Titans costume wreak havoc on the Warner Bros. studios lot. "Red Carpet Mayhem" (2 minutes) uses clips from the movie to make a short which plays like an alternate trailer. "Everything Is Fake" (1 minute) is a deleted scene which is presented in pencil animatic form. In addition to this, we get "Storyboard Animatics" for two other scenes. "Teen Titans Go! : Translated" (2 minutes) offers a handful of shots in various languages. We get the MUSIC VIDEO for "Go!" by Lil Yachty, as well as "Silkie Sing Alongs" for three songs from the film. The final extra is an episode of DC Super Hero Girls.